Athena’s Day is already being prepared for, but it won’t be marked until Thursday. 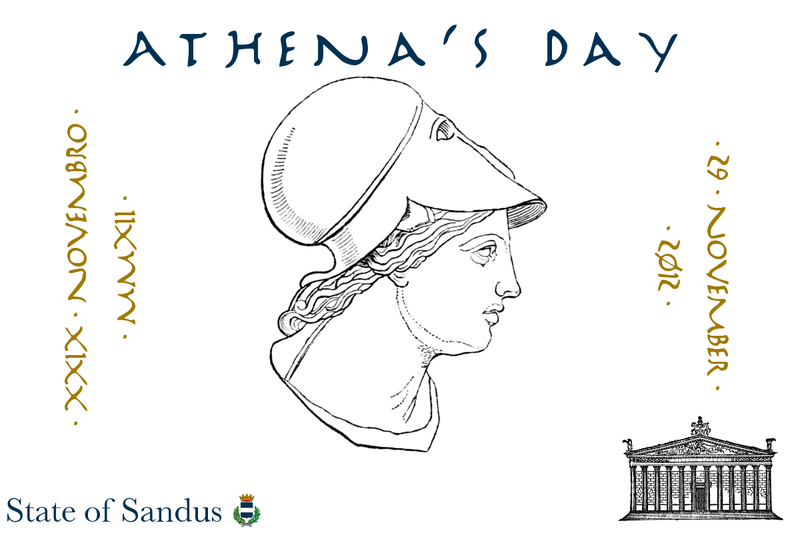 A Sandum version of the ancient Athenian festival of the Khalkeia, Athena’s Day is celebrated to thank and ask the blessings of the patrons of the arts, creativity, and ingenuity: the Sandum patroness Athena and the god Hephaestos. The implications of this Athena’s Day, though, are already clear. This will be the first time the Collegio Sacerdae formally consecrates a shrine — the State Polytheist Shrine to Athena and All the Gods — as the State Buddhist Shrine was not consecrated. With the view that Sandus is a craft and a work of art, the consecration of the shrine within the physical Office of the Sôgmô will create the symbol that Sandus is a work of art — a creative, cultural and national entity — that deserves the blessings of the patrons of the arts themselves and their continued patronage. As Sandus and Sandum policy are the art of the State of Sandus in the context of this festival, it shares the democratic belief that this “art”, or politics, should be open to all and, as Lenin said, all should learn how to run the country. The Sandum importance of Socialism and Democracy in government and society (referred to as “the art” of the State), Sandum tradition to mark the festival, and the cultural importance on the epithets of Athena are important aspects of Sandum culture. Citizen André Sammut has submitted this poem to us. 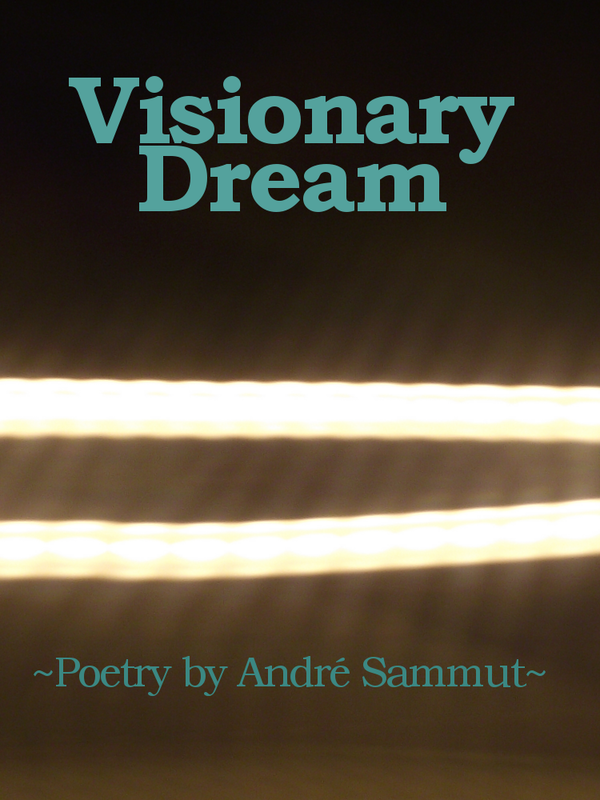 This poem, which is a part of his upcoming e-book, exemplifies Sandum taste for simplicity in poetry and in art. Quite unlike the Sandum style for essay-writing, Sandum literary style stresses the short, the quick, the brief. Also, this poem exemplifies the Sandum artistic preference for landscapes. Landscape paintings and photographs are the most revered in Sandus and this is the same for poetry as well. With Sammut’s poem, the serene landscape of the mountains covered in rice paddies come alive as a cloud goes by. This poem seems to express a sentiment of impermanence, as well, with the cloud passing by such a serene environment: a sentiment that is too very Buddhist and, as a result, very Sandum. We look forward to the rest of Citizen Sammut’s e-book. The Sandum artistic style for landscapes and simplicity and the Sandum importance on impermanence are important aspects of Sandum culture. It has recently become certain that the Sandum anti-Federalism advice and theory was correct in its prediction and, as a result, it has become controversial as many see Sandus as being interventionist because of pointing that out (Suckers, hahaha!). However, a perfect piece of advice was given to us by King Adam Oberstadt of the Kingdom of Uberstadt that said that I should differentiate between the times where we act in an official capacity and in an academic capacity. As Sôgmô, I do play official roles; but, being the son of a professor, I am constantly observing society and, especially, our micronational world. Back last Spring, as Realism was beginning its importance in our State, I noted that the experience of Sandus in the St.Charlian Commonwealth as a territory — a member of the Commonwealth that would be destined to become a federation — was becoming more and more important to the general rule of Federalism in our intermicronational community. As nations such as A1, Nemkhavia, and St.Charlie had formed their own federations, we noted our experiences in the Commonwealth as an experience of failed federalism and used that in conjunction with our concept of “Activation Energy”: that certain systems of government require a certain man power or “energy” to run efficiently, i.e. a republic requires more [active] citizens than an autocracy but an autocracy becomes outdated with more [active] citizens. We noted and compared our experiences with events happening in A1, Nemkhavia (and its diplomatic mission to Zealandia and Amager), and St.Charlie to Sandus’s experience, the Realist theories, and several other micronational experiences. Many argue that instances such as these constitute interventionism because the leader of a micronation is thought to be intervening in the policies of another state; however, in no way can academic discussion be considered subversive or intervening in the sovereignty of an other state and, if one does consider it to be that way, then one must be anachronist because such has been done for a very long time. But, more importantly, this opens up the concepts of an academic and intellectual government class. Going off the report for Athena’s Day, which noted Lenin’s quote on how a cook should be able to run a country, the concept of Plato’s philosopher-kings is closely related to the Sandum government. In the context of history, the Chinese scholar-gentry — the Chinese imperial bureaucracy — comprised of people who served intellectual and government roles. After their government work was completed for the day, they were expected to go home and perform cultural and civil work — such as write poetry, perform recitals, et cetera. In my case, my cultural work is forming the Sandum philosophy with Realism, Libera, the Sandum value, and so on. I also create music, make art (often in the form of posters), author and conduct rites as Sacra Flameno, et cetera. But there is no title for my work as an academic or, if you’d prefer, a scholar-gentry official after hours. M. Oberstadt helped me note the difference between when I was acting as Sôgmô and acting as a Sôgmô after hours. When I act as Sôgmô, I am conducting or performing policy; i.e., I am doing an action in terms of the Sandum government. When I act as Sôgmô-after-hours, I have theories, arguments, etc. And these arguments are important, as Oberstadt noted himself in his article in On the Sector (which, if you’ve read this far here, you really should read too). And though some argue these arguments contravene the CCPS’s decision to become more isolated and reduce Libera‘s self-defence clause, they don’t because I am not acting in an official capacity. Though we may become more isolated, as we do each Winter, this does not mean that Sandus will be without its nation-building arguments. No official title exists for me as Sôgmô-after-hours. Perhaps someday another college like the Collegio Sacerdae will form intended for these sort of academic arguments, perhaps a university will organically form (historically, universities began as places for theologians to argue; but, for some reason, micronationalists by-pass history by beginning universities for classes and education only. Silly micronationalists! You really should follow history!). Should such a university form, then perhaps I will have that title so that I can differentiate when I’m making arguments or not for academic purposes on the basis of the micronational phenomenon. But to make a cultural cooperative in Sandus just for me seems a bit excessive. At least the Collegio Sacerdae serves a greater purpose than just me: it conducts religious and cultural festivals, it does religious and historical research, and it is open to all religions (Jonathan Caesar, an Orthodox Christian, is member of the Collegio). The Collegio serves a role other than just for culture, too; it also serves to designate when I am acting as Sôgmô and when I am being religious for the sake of my religion and my micronation. After all (and few know this), our government is a secular institution; it has no established or official religion. But for now, until our State grows and we have a greater need for a university, Sandus will continue to be comprised of its philosopher-king and its scholar-gentry (basically, all active Sandum citizens — all three of us) that will serve nearly three capacities: in government, in culture, and in academia. Perhaps this rather informal and — gasp! — unprofessional editorial will show you that Sandus is more than just seriousness, “drabness” (as President Lindström puts it), and everything else stereotypically Sandum. We’re about intellectualism, cultural independence, and running a sovereign state. And though many of you may disagree with how we do these things and say we’re hypocritical (especially you, Wilary), aggressive (you, Bradley), and just plain mean and how you want our articles to be banned from the MicroWiki news feed (you, Daniel), I would like to believe that we play a semi-important role in our academic research on micronationalism, in our importance on cultural advancement, and in much of what we actually do do (and not say or argue, there’s a big difference!). If you don’t think so, to each their own. But, personally, I wouldn’t want Sandus any other way. I like the ways things are (because history is a big bunch of cycles and the argumentative cycles give more meaning to the calm, friendlier cycles). Well, maybe with a few more citizens. Being Sôgmô gets boring and stressful sometimes. By tradition: All that which was covered in this editorial — from academia in Sandus, to cultural independence and historical importance (and all the un-named bits) — are important aspects of Sandum culture.